It's not often that I get the chance to feature other film makers who are just starting out and are going through the motions about how to approach their own career in film. I got to know Alex through my blog and YouTube channel, and since then I've enjoyed our numerous discussions about film. He's made me consider a lot of my own choices with some of his questions about film school, and it's been a lot of fun to hear about what he might like to do and how he might want to get there. I look forward to seeing how Alex continues to grow as a film maker and am happy to have made another lasting connection via the web - always expanding that network! So, without further delay, here's Alex to share a bit about himself. To start I'd like to thank Luke for letting me voice myself on his blog! My name is Alex Chandler, and I'm an aspiring film maker from Washington State. Currently I'm looking into film schools that will help achieve my goal in this career. But at the same time I'm making lots of short films and learning film techniques wherever I can find them. 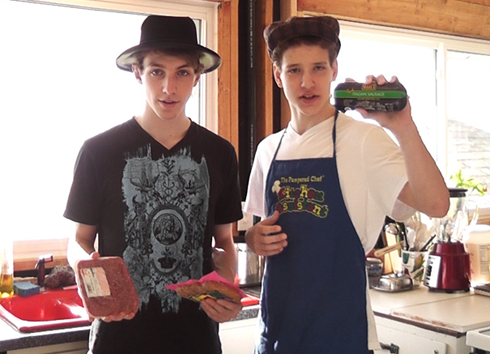 Alex (left) with friend, Ethan. One of the bigger projects I've been working on with my team, Filming Humor, is a series of short films. The first one, The Spies; Layer of the Devil was released Christmas day 2010. The other two our going through the process. With the first video, we learned a lot about story telling, weaving a story together, and realized a lot of our difficulties on location. From this we were able to create "The Directors On Scene Checklist." This checklist came in very handy during the filming of the sequel, The Spies; James and the Vampire. Because the two directors, myself included, were on location working together and knew the checklist fairly well, helping the footage turn out great. Another key bonus put off by using the checklist, was that we were able to run through the script in a much more timely manner. The only reason we were rushed at the end of the day, was due to the battery dying...unfortunately a spare battery is another couple weeks from being owned...just bought it on EBay. The point here is that with each experience there is a lot of hands on learning that goes on. I mean it's a lot of trial and error, but with a lot of my friends in drama, and myself taking classes related to film in general, we are able to figure things out a lot faster. One thing that has happened dramatically fast between the last few short films we've made, is improvement to the plot. My friend Mariah is a writer, she has been helping develop the story and plot lately. And because of her insight we have reordered scenes out of chronological order, and grown depth to characters. Really a strong team helps you grow, which is one thing to look for in colleges. You really want a hands on experience, and once you get out of the college you will want to know a lot of different people, with different sets of expertise. Where as I personally am an editor, I might need to meet up with all sorts of other specialists. Looking for a college to go to will be quite a difficult task for anyone, and there are tons of options. Luckily for me I have Luke to ask for advice from, and his numerous life experiences. The first thing I've discovered that I need to do, is decide what I want. In general you will like one part of film making. I enjoy editing the most, but of course everything else is fun too. But the key to choosing what, where and, everything else is really a personal preference. From my point of view there are multiple options. You can freelance video edit and film, similar to what Luke does with Stream Media. You could also work for a company, and have a steady income; as in the case of Luke, he has Weddingstar. And then the one option I find the most tasteful, is that of a cinematic nature, more of a Hollywood sort of thing. Personally I couldn't say what I'm planning to do yet, but it will take a lot of time and thought to fully decide. Alex's YouTube Channel, Filming Humor Here. Thank you again Luke for the guest post! That's great you are encouraging others, Luke. Neat post. No problem, Alex. It was a lot of fun to have you create a post and share your thoughts. You're welcome to do another any time.